Abhijay Kodali today won the 61st Annual Golden Chick Dallas Regional Spelling Bee presented by the Dallas Sports Commission at the George W. Bush Presidential Center in Dallas. Kodali, 12, a 6th grader at McKamy Middle School in Flower Mound, recorded a perfect score of 25 on a written test that was given to the final four contestants. He was the co-winner of the Dallas Regional Spelling Bee in 2018 and finished 3rd at the 2018 Scripps National Spelling Bee. He will again represent the Dallas Region at the 2019 Scripps National Spelling Bee that takes place May 26-31 in National Harbor, Maryland. Today's Bee began with 24 students from North and East Texas. After eight rounds of today's Bee, it was decided to have the final four contestants go to a 25-word written test to determine the winner. The written test also produced two spellers with 24 of 25 words correct for a second place tie. Golden Chick and the Dallas Sports Commission decided to send both second place spellers to the National Bee. Rohan Raja, representing the Dallas County Public Schools, and Sohum Sukhatankar, representing the Dallas County Private Schools and the 2017 Dallas Regional Bee winner, tied for second place and will both also represent the Dallas Region at the 2019 Scripps National Spelling Bee. Both competed at the National Bee in 2018, with Raja finishing 10th and Sukhatankar finishing 25th. In 2018, the top three finishers at the Scripps National Spelling Bee were from the Dallas Region. Karthik Nemmani of McKinney captured the national title over second-place finisher Naysa Modi of Frisco and Kodali finished third. Modi and Kodali were co-winners of the 2018 Dallas Regional Spelling Bee while Nemmani was a "RSVBee" entrant for the National Bee. Modi finished sixth in today's Dallas Regional Bee. The three spellers representing the Dallas Region in 2019 will receive all-expense paid trips to the Scripps National Spelling Bee where they will represent North and East Texas in the national competition, taking place May 26-31, 2019. Additional information on the National Bee is available from Scripps at www.spellingbee.com. Today's 61st Annual Golden Chick Dallas Regional Spelling Bee will be broadcast on WFAA-TV, Channel 8, on Saturday, March 16 at 12 noon. 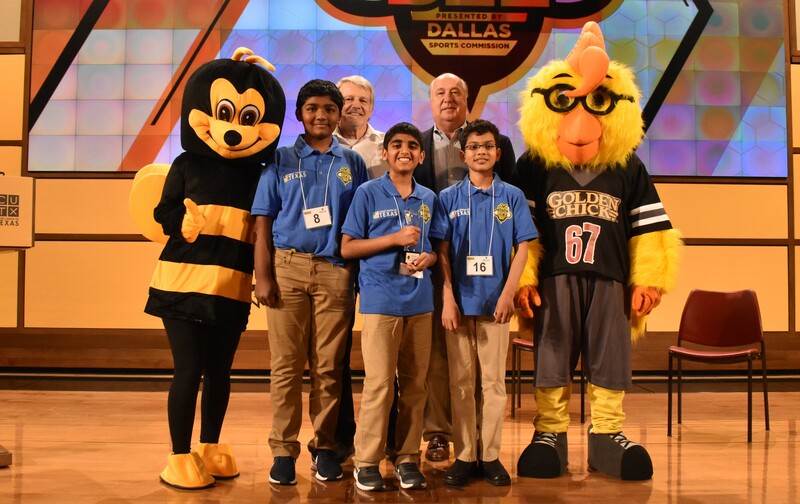 This year's Dallas Regional Bee sponsors include Golden Chick, CareNow, Credit Union of Texas, Crown Trophy Plano, Children's Health, Dallas Stars, Dallas Mavericks, FC Dallas and WFAA.